Ultimately, James is introduced to a young lady named Alida Armstrong who is in some desperate straights of her own. The two agree to a "strictly business" marriage wherein they will be man and wife on paper but he'll give her protection and provision and, in exchange, she'll help out around the house and farm. You can see where this is going, right? Edward Payson Roe was born in New York in 1838. He attended Williams College and Auburn Theological Seminary. He served as a chaplain to the Second New York Calvary before taking up a pastorate in Highland Falls, New York. In 1874 he left the pastorate, moved, and took up writing and farming. He wrote 20 books, He Fell In Love With His Wife being the 14th. 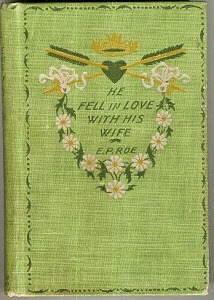 His novels were very popular in their day, particularly among the middle class in both America and England. His books were translated into several European languages. In every age and at every time, there are always Christians who feel that you ought not to read any sort of fiction but stick to the Bible and non-fiction. Apparently, due to the fact that Roe was a former pastor, this eased people's consciouses a bit and helped soften that time period's prejudice against fiction. After his death, people were clamoring for more information about the man and so his sister wrote a biography about him which is available online. I skimmed the first chapter and it looks really fun and interesting. Thanks, Shannon, for recommending this title to me! You've opened up a new world and I very much enjoyed the first visit. I'll check in with Roe again in the future, I've no doubt! Sound like my kind of book. I am like Amy and Stephanie--your description was bringing back memories of a previous book read oh so many years ago! Sounds like a lot of fun! Just ordered it! I downloaded it, thought I would read it on the marriage cruise. . .what was I thinking?! LOL I spent time with my hubby instead. But I'll hopefully get to it someday. . .